Credit where credit is due. We may mock Richard North for the anger and venomous personal attacks that so marginalised him during Brexit and its aftermath, but he seems to have recovered his equilibrium and come up with an excellent exposé of the malign role the EU has played in pushing the CAGW agenda at the expense of safety considerations. As to why the EU did not act, one can see that it has been obsessed, to the exclusion of all else, with its climate change targets. As such, with so much effort going into pursuing the targets and creating the legislation and policy environment needed, it simply didn't have the resource (or the political will) to deal with the complex issues of fire safety at the same time. His account strengthens the realisation – which others have surely had – of the way UK MPs and ministers have been emasculated by the legislative dominance of the EU. The British subordinates cannot take decisions and won't take decisions and kick the can along the road until the directive from Brussels arrives that tells them what they should do. When Britain becomes a sovereign nation again they won't be able to do that anymore. Update: An earlier analysis on Spiked. 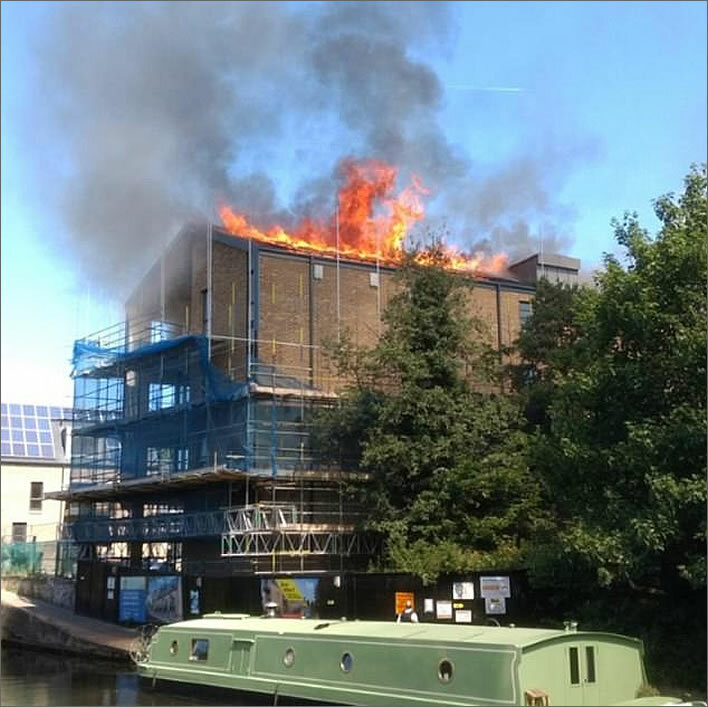 The best energy output from solar panels is achieved by setting fire to them, as was demonstrated in London yesterday. Just don't breathe in anywhere in the vicinity. Fortunately no one was hurt. Image: MailOnline. 01.07.2017 – Whats in a name®? Great news! Bey [Who? – Beyonce. [Who?]] and Jay Z [Who? – Shawn Corey Carter. [Who? – He's a rapper [A what?]]] have had twins: Rumi® [Rheumy? Roomy? (as in 'roomy back seat')] and Sir Carter® [Sir Carter® Carter?]. The names really have been trademarked, nothing too good for the little mites, hey? The twins have a big sister called Blue Ivy®. Meanwhile, while Rumi is a Japanese girls name, it's also the last name of the famed 13th century Persian poet Jelaluddin Rumi. 'Sir' also happens to be used in one of his most famous poems: 'Bring the pure wine of love and freedom. / But Sir, a tornado is coming. / More wine, we'll teach this storm / A thing or two about whirling'. Somewhere where you can waste 20 minutes in the company of idiot, anti-science climate-change deniers discussing ice-ages. These people should be silenced for the good of the planet. CO2 doesn’t appear to have much role in paleo-climatology. If temperatures are determined by obliquity, then CO2 is just going along, and any effect simply adds. But if CO2 has not ruled temperatures in the past, why do we think it should now? Comment by 'Javier' June 14, 2017 at 10:56 pm. Disgusting.